Tonight’s episode, the fourth season premiere, is a clever satire of not just the show itself but the entire network. (A show-closing jab at “The Jay Leno Show” is a true gem.) “30 Rock” has never set the ratings on fire, appealing more to critics than actual viewers. It doesn’t really have that big a following or audience. And the season premiere brilliantly and subversively plays off the popularity, or lack thereof, of the show itself. Tracy Morgan, Alec Baldwin, Tina Fey, Jane Krakowski, Jack McBrayer. In the premiere, “Season Four,” Jack (Alec Baldwin) tells Liz (Tina Fey), Tracy (Tracy Morgan), and Jenna (Jane Krakowski) that “TGS” needs to make a few adjustments to become more relatable to the masses. Jenna decides to makeover her image, including a hilarious sports theme song a la the opening number to “Monday Night Football”. Tracy takes to the streets to get in touch with the common man again. Meanwhile, Jack sends Liz and Pete (Scott Adsit) to find a new cast member for the show, something that Tracy and Jenna are not going to take very well. 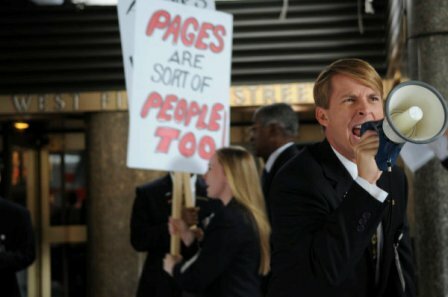 At the same time, Kenneth (Jack McBrayer) leads a hysterical Page strike after accidentally seeing how much Jack makes. Steve Buscemi guest stars. “Season Four” Episode 401 — Pictured: Jack McBrayer as Kenneth. The first episode of the fourth season of “30 Rock” is nearly perfect. Each cast member gets a scene or two to shine and the overall self-awareness is clever without being smug. The show has reached the point that it’s merely comforting to have the characters and the writer’s sense of humor back on the air like later seasons of “Cheers” or “Seinfeld”. The state of comedy on television is simply weaker when “30 Rock” is off the air. Remarkably, the second episode is even better, standing among the best in the history of the show. “Into the Crevasse” features the return of the great Will Arnett as Devin, plotting revenge against Jack by bringing down GE and him with it. Jenna continues to work against Liz by getting a hilarious acting gig that takes her away from her work on the show and every man in town is angry after the publication of Liz’s book. Kenneth gets a job at an animal shelter. If it’s possible, and I certainly think it is after a slightly-down third season, “30 Rock” has gotten better in season four. This is the best opening pair of episodes for any season of the show to date with rapid-fire dialogue, unpredictable plot turns, and great performances. There’s a scene between Arnett and Baldwin in the second episode that is one of my favorite of the year to date from any show. With consecutive wins for Best Comedy Series, it seems likely that the rest of the industry is waiting for “30 Rock” to fall from its pedestal. Based on the excellent fourth season premiere and its even better second episode, it doesn’t look like that’s going to happen this year. ‘30 Rock,’ which airs on NBC, stars Tina Fey, Alec Baldwin, Tracy Morgan, Jack McBrayer, Jane Krakowski, Scott Adsit, and Judah Friedlander. Season four premieres on October 15th, 2009 at 8:30PM CST.